If a 24-second burn made around the Moon's far side could lower the spacecraft's near-side altitude from 300 kilometres down to only 17 kilometres, it is easy to see that it would only be necessary to extend the burn by another second or two for the altitude to reduce to where impact with the lunar surface could become a real danger. The precautions involved in the DOI burn are understandable in view of the fact that there was considerable uncertainty about the Moon's precise shape, especially with regard to the more northerly regions that were later overflown by two of the J-missions, Apollos 15 and 17, where some of the mountains reach 4 or 5 kilometres above the surrounding terrain. DSKY. For the DOI burn, this readout typically began at 210 feet per second (64 metres per second), which was the amount by which their velocity along the x axis had to drop. As the burn progressed, they would see this value decrease towards zero. If the computer did not shut the engine down at the expected time, the crew had to be prompt in terminating the burn manually. They then consulted the DSKY to see if there was any overburn. The rules were that if they had slowed only 2.2 feet per second (0.67 metre per second) more than planned, they should immediately use their RCS thrusters to regain this speed. 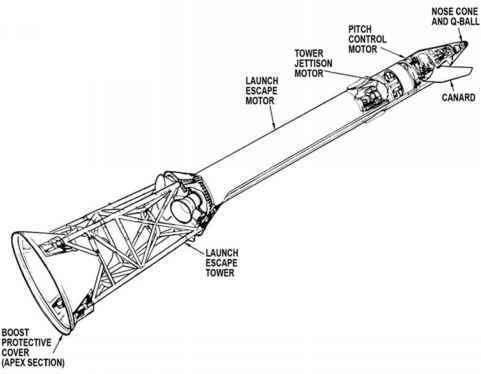 If the reading was in excess by just 10 feet per second (3 metres per second), they were to turn the spacecraft around 180 degrees and regain the lost speed by firing the SPS. Whatever the result of the DOI manoeuvre, once the crew were happy with it, they began to prepare for a possible bail-out burn, in case some other sign were to suggest that they were at risk of impacting the ground. If there was, they had at most an hour before the unthinkable would occur, and because they were over the far side at the time of the DOI burn, they could do nothing about it for half of that time. This was because the final check of their trajectory would exploit the exquisite accuracy of radio tracking, which could only be done after AOS, with less than half an hour remaining before any theoretical impact. Therefore, while the tracking stations measured their trajectory, the crew waited for a call from mission control to confirm that their orbit wasn't going to spray them across some near-side mountain at over 5,000 kilometres per hour. This was never a real threat, and the crews and mission control felt confident enough with their hardware and procedures to view the bail-out burn as little more than a formality, but, in the NASA way, they were prepared for it.